I bought 5 clock movements from Klockit when I ordered the movements. 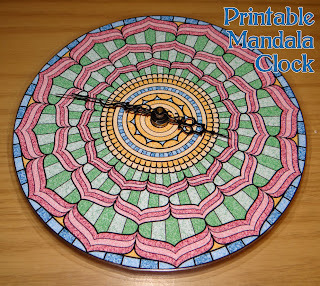 Originally the plan was to make a mandala clock, but then the other clock projects happened first. I also should have ordered more movements because this is fun and I love clocks that tick. Like the comic book clock, I did this one using lamination, but you don't have to. The project will work just fine using cereal box weight cardboard, heavy printer paper or cardstock and ModPodge. I have a laminator though and enjoy using it. For this one, you'll need to print a mandala. This is the colored version I used. Click on the image for a larger version. 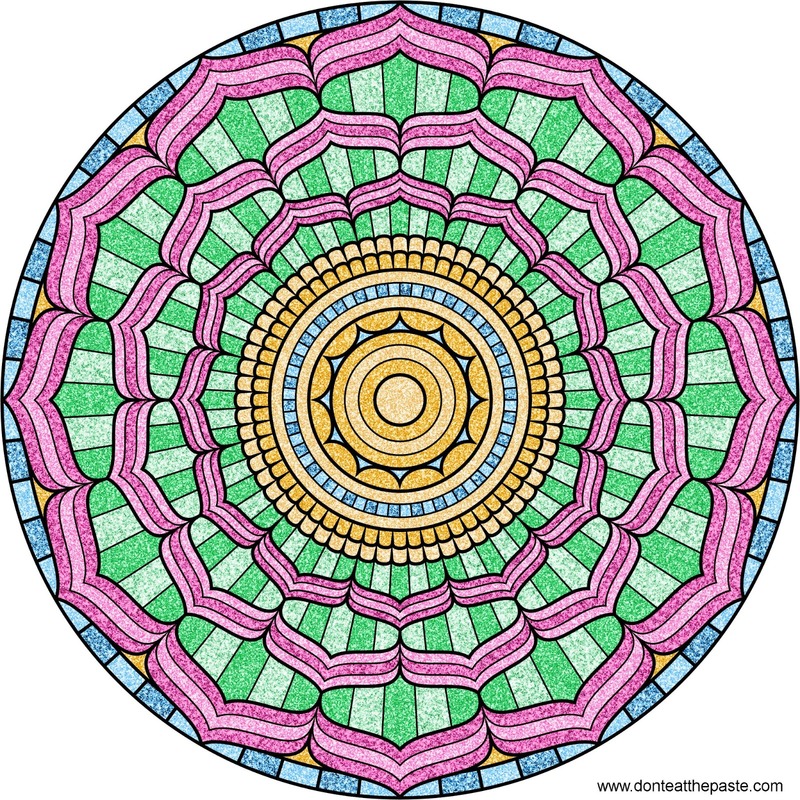 Or you can print and color your own version of this mandala HERE. 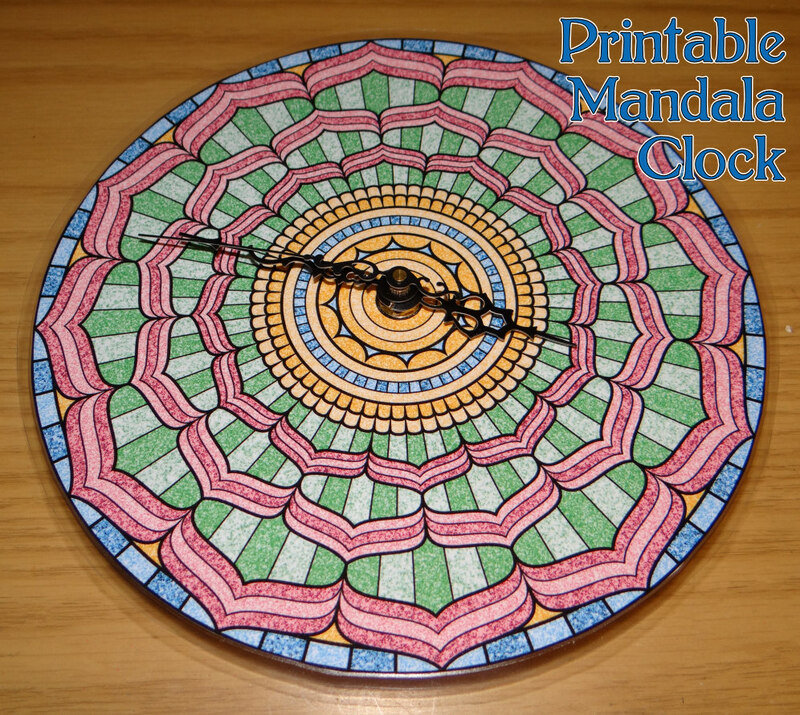 This mandala was designed to be used as a clock dial. The divisions are by 12 and 60 for hours and minutes. Any mandala will work, but I do recommend one with 4 sections of radial symmetry or with 12 sections of radial symmetry to make it easier to tell time. 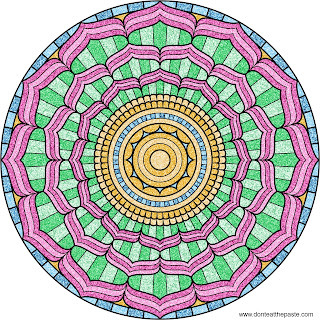 For a cardboard/card stock lamination, you'll take one colored mandala (either your own coloring or the version above) and cut it out around the mandala then cut out the second circle. 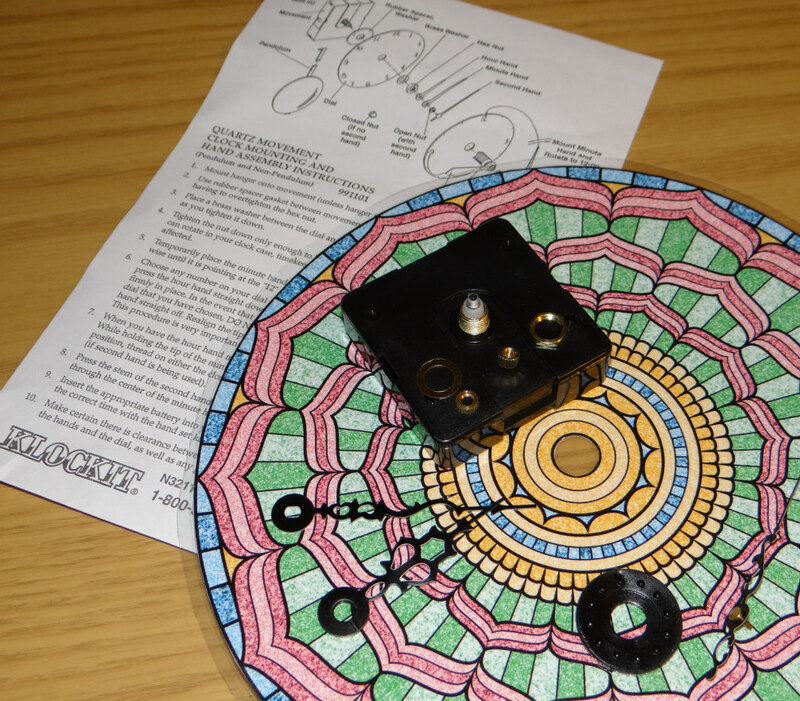 Trace that mandala and the center circle on a piece of card stock or cereal box cardboard, and then trace the inside of the larger hex nut in your clock movement kit in the center of the small circle. Cut it out just outside the tracing and check it on your clock movement to make sure it fits. Trim only a little off at a time until it does fit. Then use a black permanent marker to color the center of the backing. Spread the back of the mandala with Mod Podge and glue it carefully into place on the backing piece, then cover the surface with more ModPodge. Let dry. Follow kit instructions to install clock movement. For a laminated version, you'll follow the same steps as the comic book clock basically. Print the mandala, color it if you chose the blank version. Cut out the center circle and cut out the mandala so it's round. Cut out carefully around the mandala leaving a small laminated edge all the way around. Follow kit instructions to install clock movement. So why is this so addictive? Because it's easy and because I really, really love clocks. How easy? These are the pieces from the Klockit clock movement kit and the instructions. It's only a few pieces. 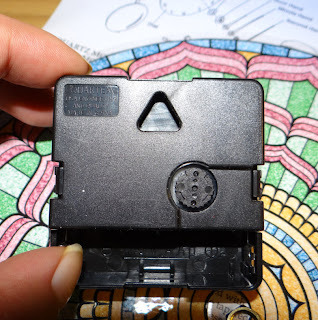 I used the #10043, which is a quartz battery operated clock movement that uses a standard double A battery and has a very short shaft which is perfect for paper clock projects. It has maximum dial thickness of 1/8th inch. Most craft store movements are designed for thicker dials. The only tricky part of installing the movement is getting the hands set just right. For that reason, I don't recommend the hands I used above for absolute beginners. The delicate scrollwork is a little too easy to bend. The spade shaped hands are really easy to set though and have a classic look to them! The rubber ring goes between the movement and the face and holds the face in place fairly well once you screw down the large hex nut. After the large hex nut, you set the hour and minute hands. The holes on them are shaped specifically to fit in different places on the movement so it's really hard to make a mistake except when you are setting both hands to the right positions. You can't accidentally push the minute hand down to where the hour hand supposed to be, and they are spaced so as long as the hands are straight, they won't lock up together going around the clock. Then you will either put on the final closed nut, or if you're using a second hand, a small open nut, then the second hand. Then it's done. Set it to the right time, put a battery in it, and tick tick tick! You can also order movements for other dial thicknesses, so if you have a clock that has a lot of sentimental value but no working movement, you can replace the movement yourself. The back of the movement has a hanger on it, which is perfect for the paper clocks.